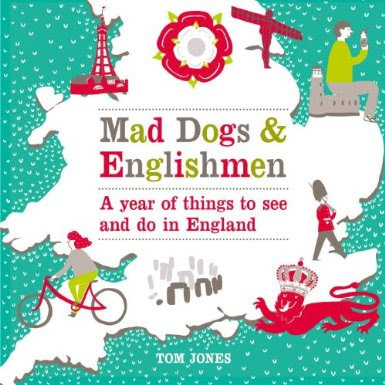 It's been another full year at Tired of London, Tired of Life, with the most exciting news being that your author has written a book based on this website, which is scheduled for release on 5th January by Virgin Books. 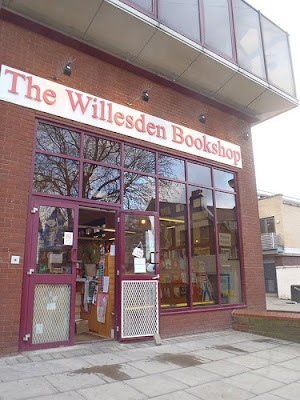 Your author hopes readers who have enjoyed the website might consider purchasing a copy and would also consider attending the book launch he is hosting at the Gallery Cafe in Bethnal Green on Friday 6th January. 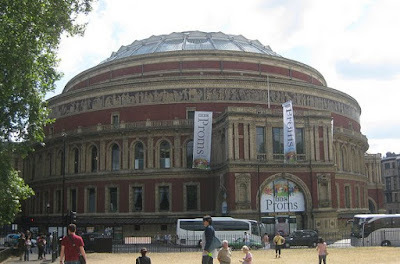 Alongside this exciting development, it's been a year full of other events, one of the most enjoyable being a trip your author took in August, joining with Ian from IanVisits to take Boris bikes to Paris, for a trip which tickled the fancy of the national newspapers. Your author also launched Talking To Strangers, a monthly evening for people in the capital to have interesting conversations with people they have never met before, which has so far been well received by participants and will continue into the new year. There were also podcasts for Londonist Out Loud and Art on Air London Essentials, which were enjoyable, and in December, your author led a walking tour of Soho for Nokia. 2012 looks set to be an interesting year for the capital, with the Mayoral Elections, the Notting Hill Carnival, Charles Dickens' 200th Birthday, the Diamond Jubilee, the Chinese New Year, St Patrick's Day, the Lord Mayor's Parade, the London 2012 Festival, the London Marathon, the Baishakhi Mela, the Blackheath Kite & Bike Festival, and Bonfire Night making for a pretty full calendar, but we shouldn't forget that the Olympic & Paralympic Games are also scheduled to be taking place in a park near Stratford for a few weeks in the summer, even if we haven't got tickets to attend. Thank you all for continuing reading this year. It has been fun. 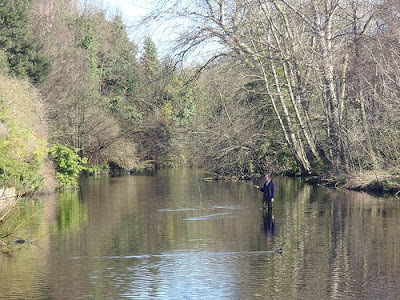 Gathering together a range of fascinating artefacts and information about the London Borough of Brent, the Brent Museum is an interesting visit for someone from any part of the capital, but is a must for those who live within the borough itself. 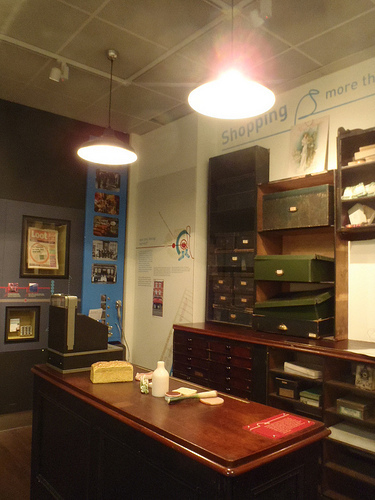 Arranged around different themes from such as 'Home', 'Transport' and 'Work', the museum attempts to educate us about the history of Brent, focussing on the period from 1850 to the present day, by drawing on a collection of around 10,000 items. 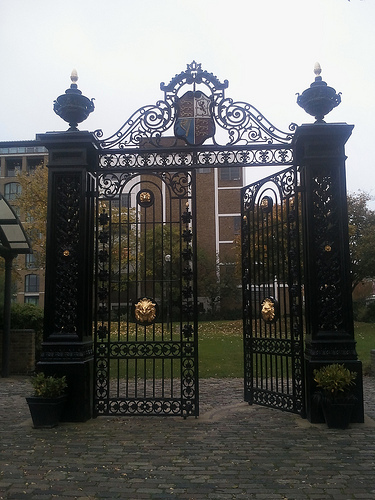 Once a large pleasure gardens, found beside the Thames at Chelsea and at its peak between 1845 to 1877, Cremore Gardens is now a mere fraction of its original size, but a small area of green survives beside Lots Road Power Station, and the original gates have been restored. 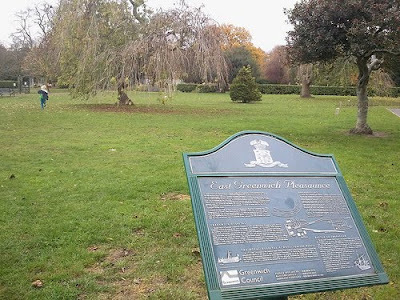 The original gardens cost a shilling to enter, and contained a range of amusements, including a dancing platform, live bands, weekly balloon ascents, restaurants and even firework displays. 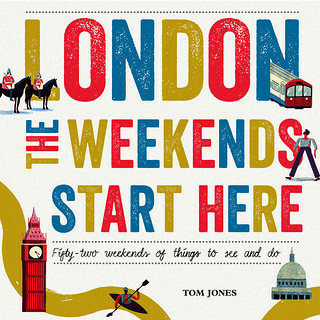 Whilst your author is entirely content sitting in watching mindless telly and going for occasional walks, there are of course others looking for things to see & do. 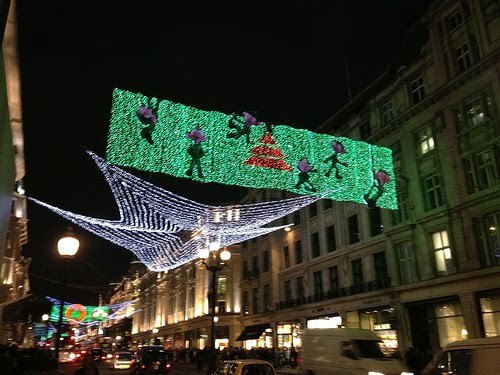 This year's Oxford Street Christmas lights remain up for a week or so yet, and consist of huge snowflakes. They're always smashing, and this year were switched on by a girl band and someone off the radio, who were keen to stress the involvement of a commercial sponsor. Though there have been some rather unsavory goings on in the area over the last 24 hours, the lights still have the potential to bring a lift to the heart of even cynical Londoners. This afternoon, the Blackheath Morris Men are on a tour of their area of South East London, making stops at various pubs en route. 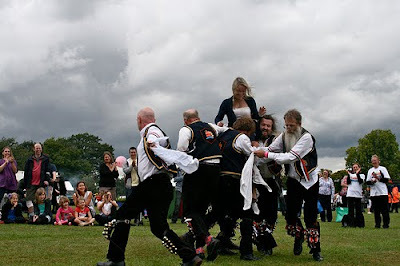 They promise to be at the Prince of Wales for 12.30, the Crown for 13.45 and the Hare and Billet for 15.00, followed by 'lively tunes in the Hare and Billet afterwards'. 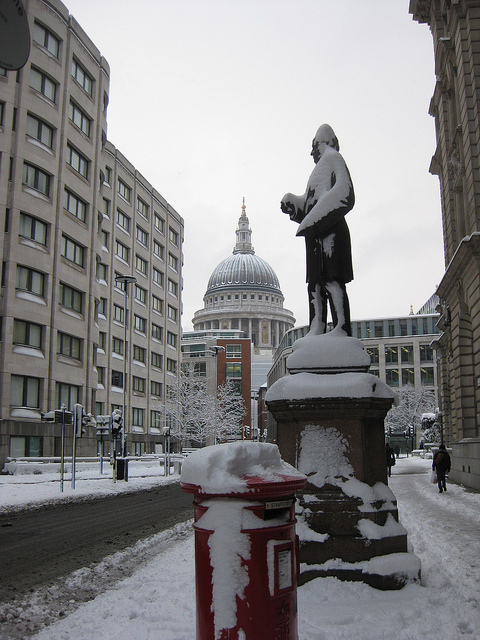 Whilst the rest of us are sleeping in, cooking and opening presents, London's walking tour guides seem to never rest, pounding the pavements and taking in London's history and culture as in all seasons. Your author has previously covered one group of London guides who turn out on Christmas Day, and this year City of Westminster Guides Pete Berthoud and Colin Davey will be joining them. For more, see http://www.peterberthoud.co.uk/christmas-day-walks/, or call Pete now on 07584 319 263 to see where he'll be. As you've surely noticed from all the relentless music and advertising, it's nearly Christmas, and if you're in the mood for a festive evening to celebrate, your author might suggest the Christmas Eve Carol Service at St Paul's Cathedral. 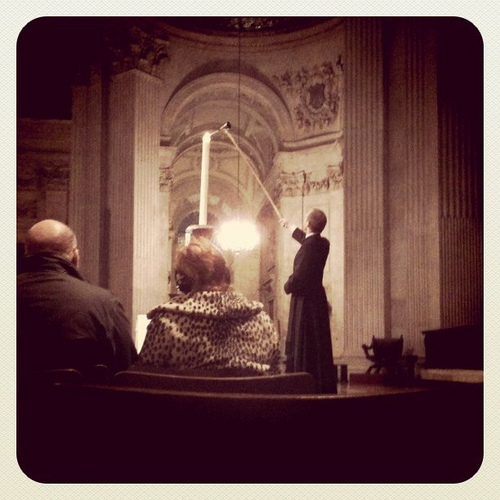 The service is open to all, is free and is unticketed, and whilst it starts at 4pm, the doors usually open an hour before the service starts, if you want extra time to soak up the atmosphere in the cathedral. For over a century, Watkins Books have served Londoners with unusual books, claiming to be one of the world's oldest and leading independent bookshops specialising in esoterica. 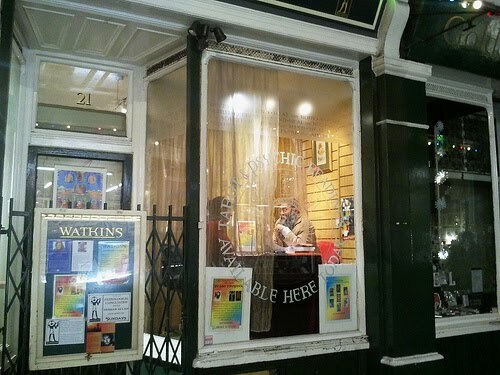 One of their more unusual services is in-store tarot readings, offered daily at their shop in Cecil Court, just off Charing Cross Road in the heart of Central London. 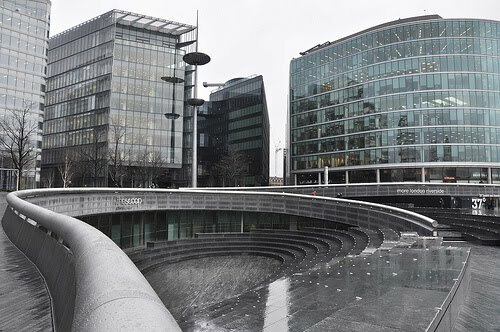 Your session will be led in a quiet window by a member of the Watkin's team, and the specialists available vary by expertise and day of the week, though the fee is always the same, currently pegged at £30 for 30 mins £50 for 1 hour. 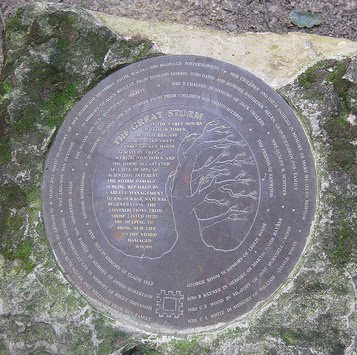 We've turned a corner and the days have already started to lengthen, and if you're looking for a place to contemplate the importance of the winter solstice, you might consider visiting Hilly Fields Stone Circle in Brockley. 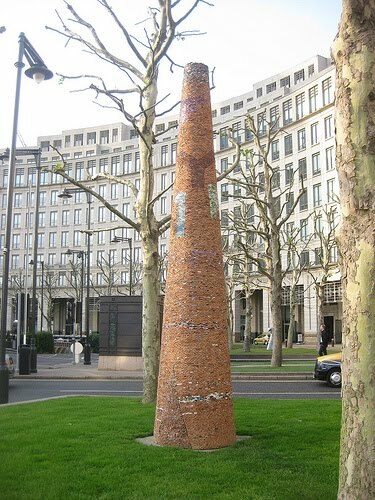 This arrangement is not the work of pagans or druids but of local artists, who arranged for the stones to be brought from Scotland and arranged as part of a millennium project, completed in March 2000. A fairly new addition to the London brewing scene, The Sambrooks Brewery in Battersea has been in business since 2008, the brainchild of Duncan Sambrook, a former accountant, who decided to become a brewer after attending the 2006 Great British Beer Festival at Earls Court. 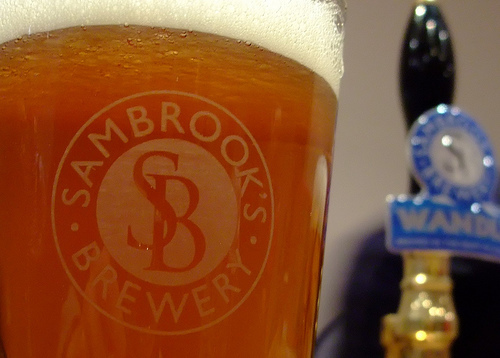 He set up the Sambrooks Brewery in urban Battersea, and already beers brewed here can be seen in pubs across London and the UK. If you're interested in seeing how they are made, the brewery offers regular tours, and has an open evening for individuals and small groups on the 3rd Wednesday of each month, which is tonight. The original layout of Covent Garden's Seven Dials area was built in the early 1690s, with six streets emanating from a central point. 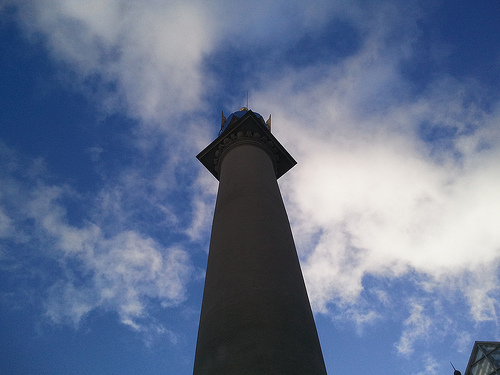 The spot is still marked by a pillar topped with six sundials, a replacement of the original built in 1694 by Edward Pierce and Thomas Neale. A seventh road was added later to maximise the houses which could be fitted on the site. 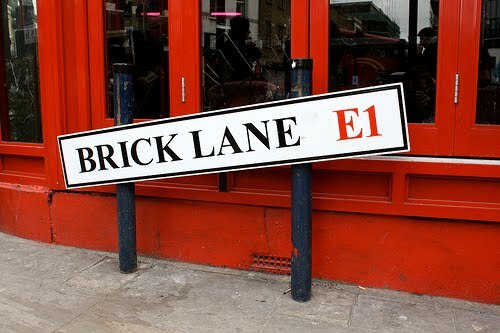 By the nineteenth century, the area had become a slum, and was featured by Charles Dickens in his collection Sketches by Boz, and impoverished until the 20th century, when Agatha Christie set The Seven Dials Mystery around the area. 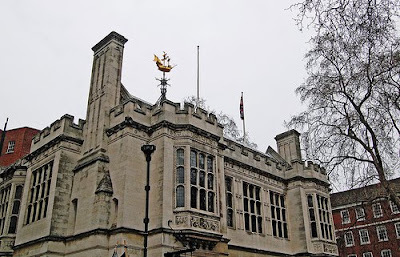 London's newest art venue opened in October, and Two Temple Place beside the Thames near Blackfriars Bridge plans to host free exhibitions in its gallery space indefinitely. The current exhibition William Morris: Story, Memory, Myth lasts until late January. We are told that the exhibition explores how William Morris told stories through pattern and poetry, and returned to the works of Geoffrey Chaucer, Norse saga, Arthurian legend and Greek myth throughout his artistic career. 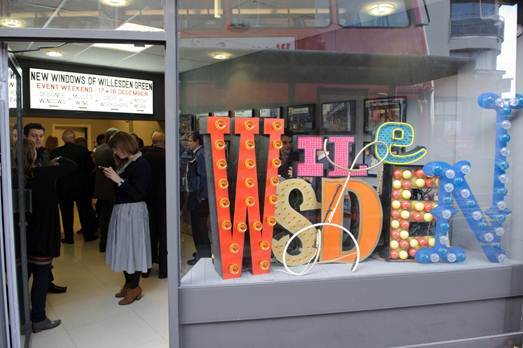 It's Christmas Day in about about a week, and to celebrate the season Willesden Green shops are hosting Windows on Willesden Green transforming 25 shop windows into an advent calendar with the help of designers and architects. 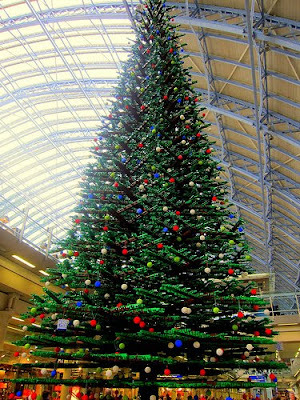 This weekend promises extra festivities, with a treasure hunt, workshops, a barbershop quartet, mince pies and and a tour of Willesden with a blue badge guide. This lunchtime, the Portcullis Singers lead a carol concert at Christ Church, on Blackfriars Road in Southwark. 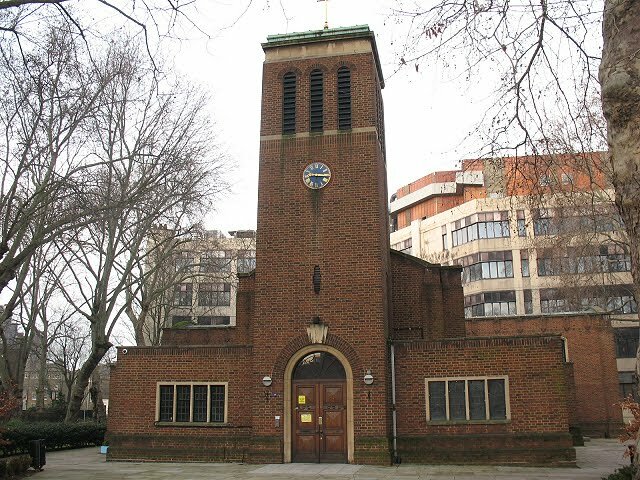 The replacement for a 17th Century structure destroyed in the Blitz, Christ Church was finished in 1958, making it a fairly modern addition to the area, but with a history which dates back much further, to a demand made in the will of Rev'd John Marshall, who died in 1631. 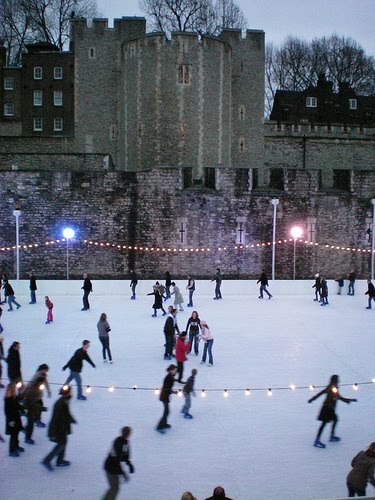 Today is the third and final day of the More London Christmas Market, a winter festival of stalls and shopping which includes free ice skating and refreshments, thanks to sponsorship by Tesco, a popular supermarket chain which began life as a market stall in Hackney's Well Street Market. There are also thirty gifty stalls selling all sorts of usual Sunday-market-fare, like jewellery, books, and crafts, and gifts on sale from budding young entrepreneurs, in association with the Princes Trust, from 10am until 6pm and all within a pleasant walk from the Sunday markets of East London, making a pleasant day out. 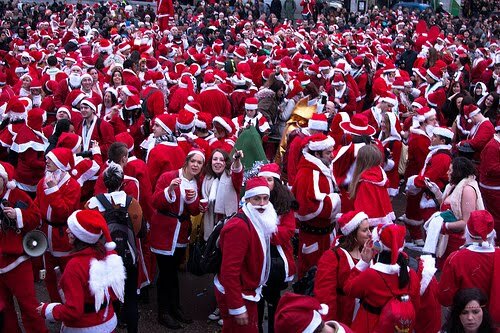 In what has the potential to either be absolutely awful or great fun, an annual tradition has begun that Londoners (including a fair few antipodeans) dress up as Father Christmas for a march around London on this weekend every year. 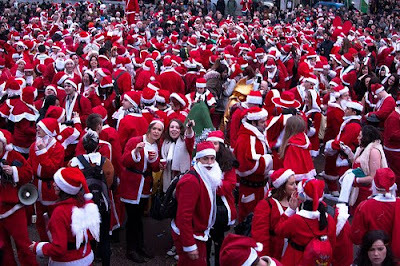 It's kind of like a Christmas flashmob, and the early birds meet in the questionable location of the Wetherspoons in Victoria Station at 10am, then push on to Trafalgar Square at 12:30 , before moving to The Horse Hospital for Christmas-themed films, and finishing the night at Bloomsbury Bowling Lanes. 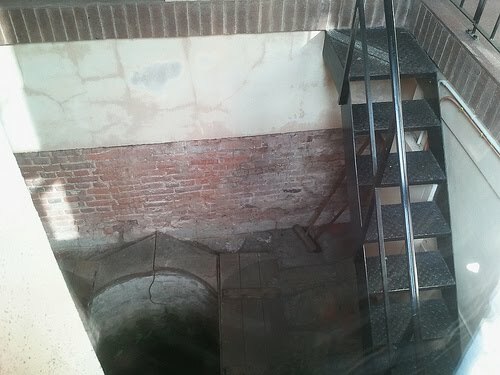 Though it has not been in formal use since the middle of the 19th century, the Well which lent its name to Clerkenwell is still visible through a window on Farringdon Lane. 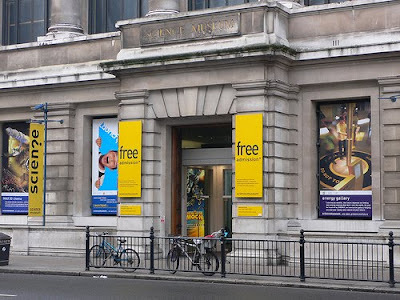 Open to the public by appointment six days a week, the Well disappeared for many years before being rediscovered as part of building work in 1924. It is not known exactly how old the well is, but it was featured in William Fitzstephen's description of London in 1174. The shops of outer London are sometimes the best, for here you find independent businesses that can afford to exist. That's why your author is always pleased when he stumbles across somewhere eccentric like Wicca Moon in Eltham. 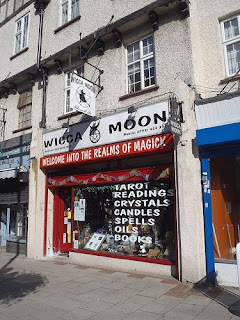 Of course, to most it's all hippy nonsense, but there is something rather endearing about a shop specialising in tarot readings, crystals, faeries and candles, and Wicca Moon is certainly the place to head for that sort of thing six days a week. It even boasts regular workshops and even house blessings. 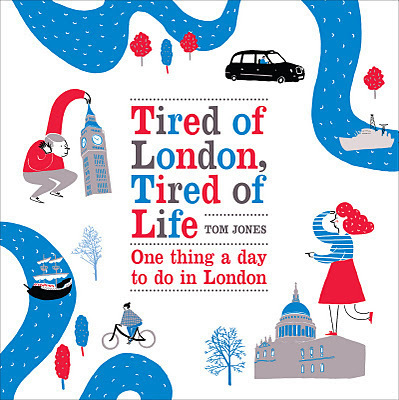 It is now less than a month until the Tired of London, Tired of Life book is released, and your author has suddenly developed an even more fervent love of bookshops than usual. One giant of London reading is Daunt Books, whose stunning flagship store has previously helped your author out of more than one Christmas present idea dry spell, but Daunt also have a beautiful shop in the literary wilds of Hampstead. 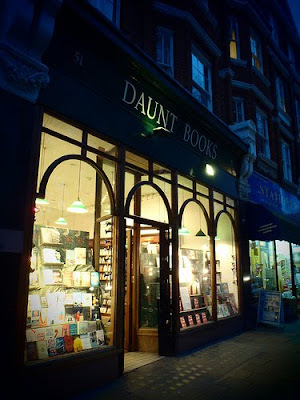 The Daunt brand is maintained well in this pretty little shop, as it is in the others in the Holland Park, Belsize Park, Chelsea and Cheapside, with a fine range of good quality titles and literary paraphernalia and other bits and pieces, and civilised opening hours which mean you can browse until 6pm seven days a week. 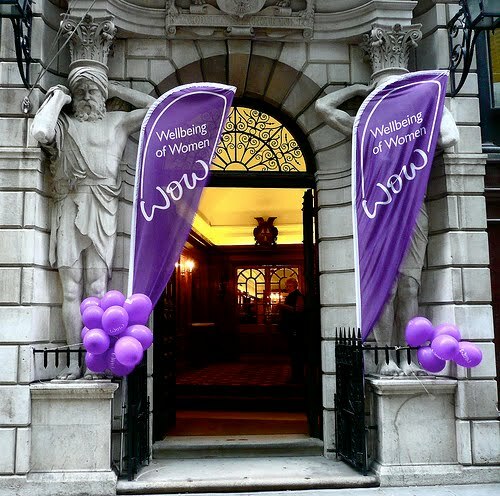 Now an annual event at the City of London's Drapers' Hall a the Wellbeing of Women Christmas Fair helps to raise money for improving the health of women and children, in the atmospheric setting of a site which has been the home of the Drapers since the 16th century. Visitors are promised stalls of luxury goods, foods and stocking fillers, and with the vital addition of a champagne bar, it sounds like a good day out. 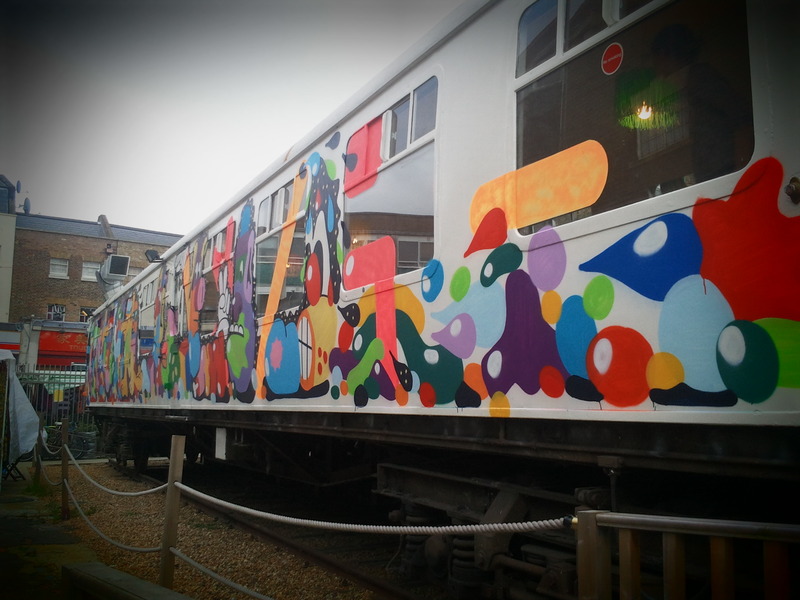 This weekend the Science Museum in South Kensington is holding the Robotville Festival, showcasing the best in European robot design. So if you're annoyed that it's 2011, and you're still not being waited on hand and foot by a robot slave pop in to meet 20 robots and their creators, and give them all a piece of your mind. 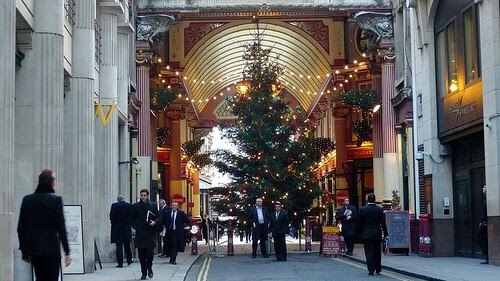 Some people like shopping, and if you are one of them the day of traffic-free Christmas shopping in the City might be great for you. For others it might be hellish. 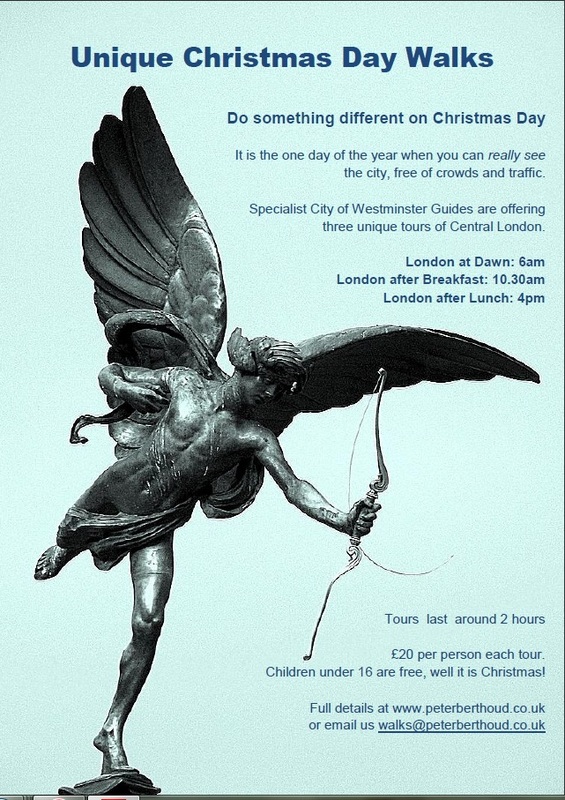 Cheapside is being pedestrianised for the day to allow people to wander unhindered from One New Change towards Royal Exchange and Leadenhall Market, and alongside ice skating, street theatre, a Christmas market and Father Christmas, there are also bands and free cycle rickshaws. 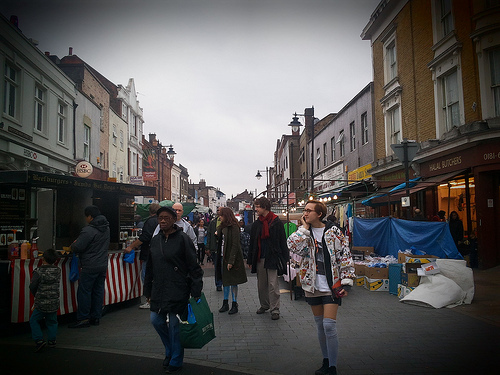 Once judged to be London's best shopping street, Deptford High Street is a great place to go shopping, and is home to a fantastic range of independent traders reflecting the area's many cultures. 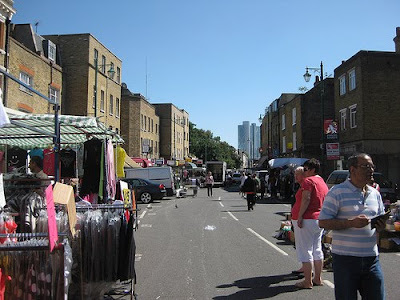 The street is also home to a great value market on Wednesdays, Fridays and Saturdays, from early morning until around 4pm, where there is always interesting produce and bargains to be had. 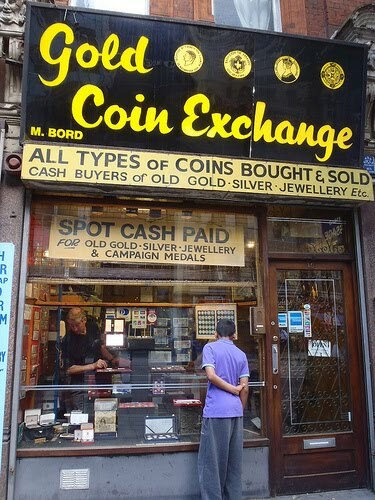 Found at 16 Charing Cross Road, Gold Coin Exchange was established in 1965 and its stock is a literal treasure trove of valuable coins, medals and banknotes. 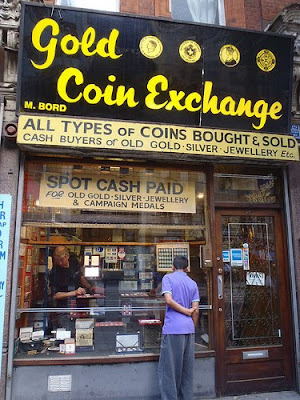 At a time when people are struggling for cash, and that which they do have is prone to lose its value, many have been putting their wealth in gold, but Gold Coin Exchange has some more interesting ways to do this, with a wide range of British and World coins dating from Anglo Saxon times to the present day. 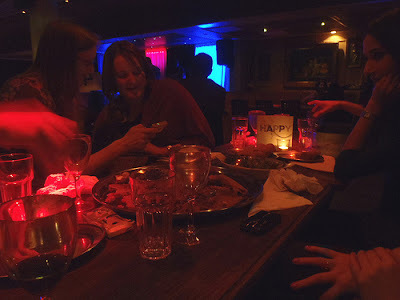 You could easily miss a place like Dahlak Eritrean Restaurant, at 256-258 Brixton Rd, and pass on by, and your author would have done exactly that if it hadn't been for a friend's birthday a few weeks ago. 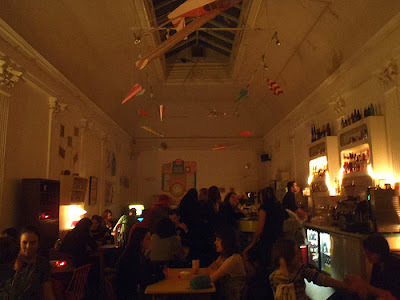 A favourite amongst the London's Eritrean community, the restaurant is also a bar and music club, and even on a Saturday night it was fairly quiet until around 10pm, when diners still awaited their Eritrean coffee ceremony and popcorn. 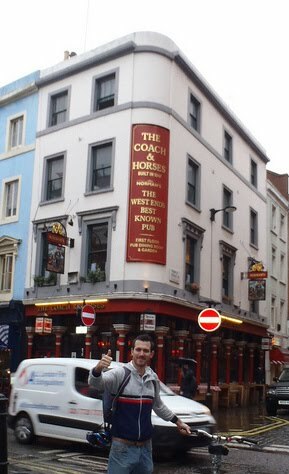 By the time this had finished, the bar and live music were busy inside but shutters outside were firmly pulled down so only the bouncers were visible. The food was excellent, and your author enjoyed that spongey bread and whilst he was chastised by friends when he compared it to Ethiopian food, Time Out tells us there isn't too much of a rivalry between the two countries at Dahlak. Placed as it is at the heart of that place where all the idiots hang out, Hoxton Street Market could never maintain it's shabby East London charm, and so it was that last month it was relaunched as a market for jewellery, ceramics, art and fashion. Commissioned by London County Council and sculpted by Barbara Hepworth, Monolith (Empyrean) originally stood on the South Bank outside the Royal Festival Hall, where it was erected in 1953, but nowadays it is found in a rather more sedate setting on the lawn of Hampstead's Kenwood House. 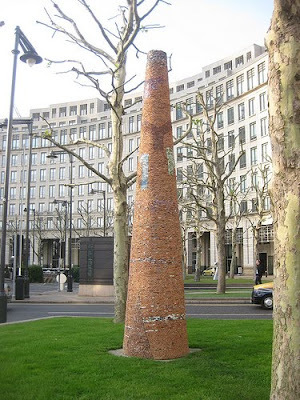 The Monolith is made of limestone and is a designated Grade II Listed structure, standing nearly nine feet high. 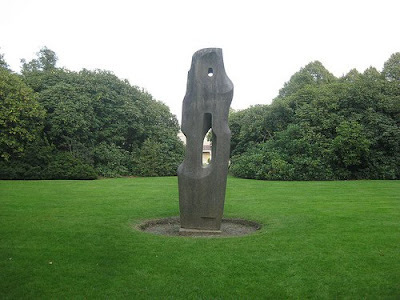 Some suggest it commemorates the death of Barbara Hepworth's son, Paul, who was killed in service for the RAF in Malaya in 1953. 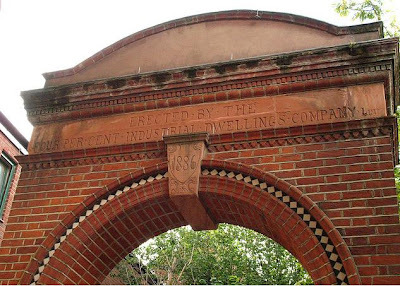 Found just off Brick Lane is the Four Per Cent Industrial Dwellings arch, a remnant of a housing development of 1885, spearheaded by Anglo-Jewish philanthropists, which attempted to shape the East End. In an area filled with slum housing, the aim was to provide decent accommodation for local people, based on a net return of a relatively low 4 per cent. 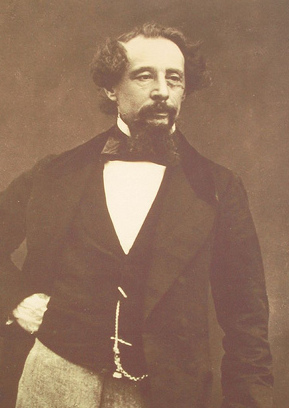 Members of the great Jewish banking dynasty led the campaign, which founded a company still in existence today. Though the original buildings on Wentworth Street, E1, no longer remain, the arch can be found there, and other examples of Four Per Cent Industrial Dwellings Company building projects can be found around London. 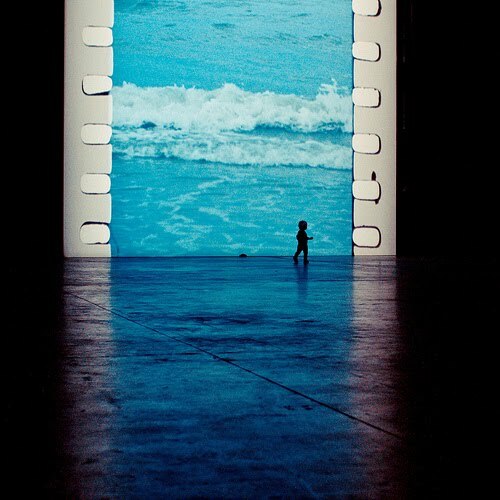 With the exception of Ai Weiwei's dull-as-ditchwater sunflower seeds, your author is almost universally a fan of the Tate Modern's Unilever Series, and the twelfth commission by filmmaker Tacita Dean is a great addition. There is something thoroughly mesmerising about Dean's eleven minute silent film, the scale of which is stunning. The only problem seems to be the single row of seating, which doesn't really allow inclusive watching, but maybe that is a bit too regimented for such a respected gallery anyway. In some areas of West London, the age of the £4 pint is already upon us, and if you want to avoid it you should probably stay out of them altogether. Having said that, your author did pay this amount for a pint recently and felt it was acceptable. Uley Pig's Ear is a beer rarely seen outside the wilds of Gloucestershire, and whenever your author sees it elsewhere he is always impressed. 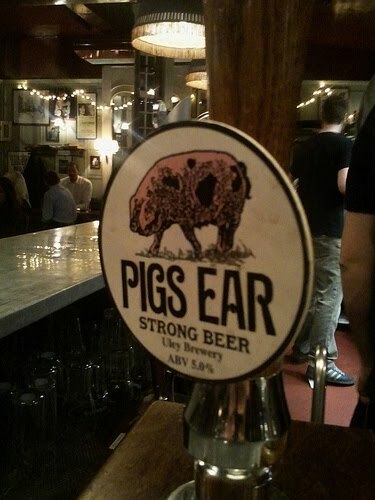 When chance took him out of his comfort zone to Award Winning Chelsea Gastro Pub the Pig's Ear a couple of weeks ago, where the beer brewed by Chas Wright with Cotswold Spring Water is a welcome regular, it was a pleasant surprise. The pub is nice enough, but for any other beer it would be overpriced and full of Chelsea types. However, for a slice of home on a dark autumnal evening, it seemed good value. 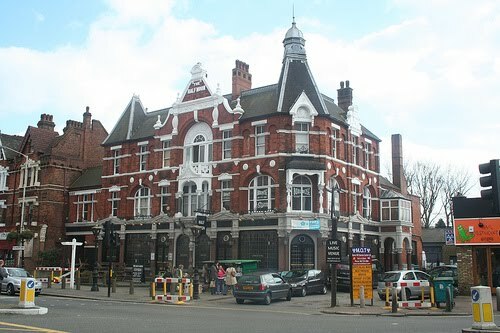 Constructed as a hotel in 1896, and designed by architect J. W. Brooker, the Half Moon in Herne Hill is a beautiful Grade II listed pub, with an attractive interior and an interesting crowd. The pub has thankfully been left largely untouched by the waves of modernisation that have afflicted other pubs, and it is known for its many mirrors - particularly in the snug bar - which were apparently constructed by W. Gibbs & Sons glass decorators of Blackfriars. They don't seem to want us to find it, hidden as it is at one end of the third floor of what is laughably called the "Official Department Store Provider to London 2012" - John Lewis - in the huge Westfield mall in Stratford. 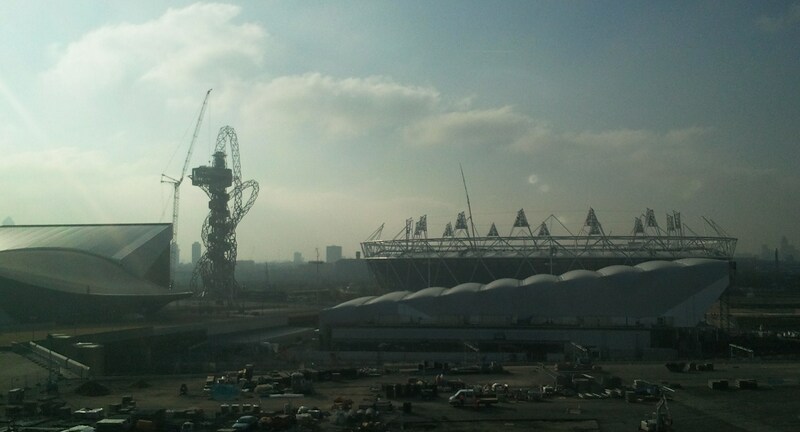 However, on a clear day the views over the Olympic Park from the observation deck are absolutely stunning. It's probably as close as your author will get to the park for some time, having been thwarted in trying to buy tickets for both the Olympic and Paralymic Games, and whilst it is clearly not as finished as Boris makes out, the scale of it all is pretty amazing. It's a shame you have to walk through acres of tedious shopping space and ask about five members of staff to get here, but that didn't deter a coach party of happy pensioners who had come to see the park, and were pleasingly dismissive of the shops. Just a shame a better camera wasn't to hand. Your author doesn't usually write about the internet, but last night saw the relaunch of a website he has long been a fan of. 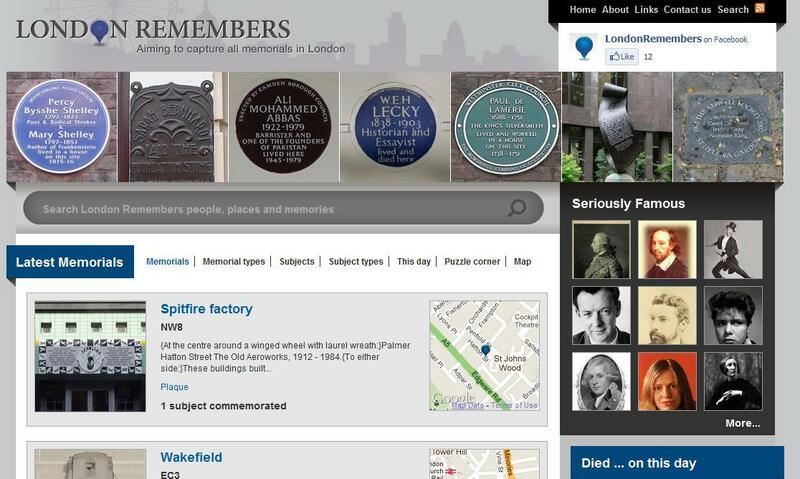 London Remembers is a fascinating project by Richenda Walford to document all of London's memorials. Richenda has spent years wandering the streets of London researching its plaques, monuments, statues and fountains, finding out about them, and plotting them on a map with context and photographs, and the new site makes it even easier to find memorials in your area, or any area of London, and learn more about them. With the weather getting worse and the days getting shorter, your author finds himself increasingly looking for escapism, and so it was that he recently took up an invitation to spend an evening by the fire at Egerton House in Knightsbridge. 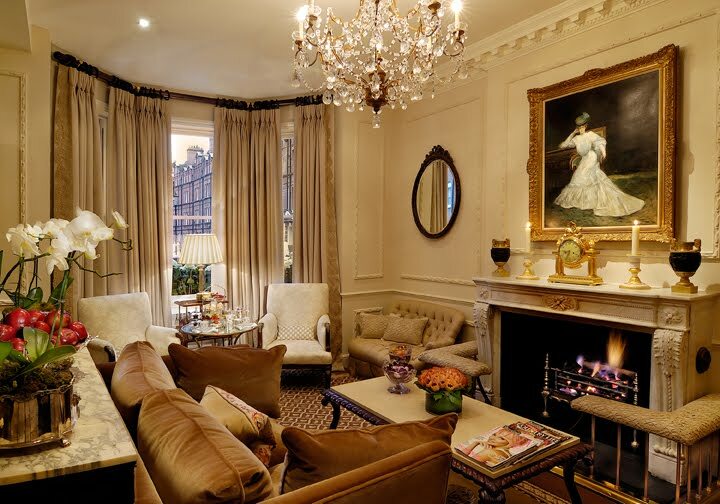 This isn't your author's usual habitat, but there is something magical about London's townhouse hotels, and Egerton House, built in 1843, is a five star hotel with just 28 rooms, giving it a wonderful feel but pushing the price of a beer by the fire beyond to £6, which is firmly in special occasion territory when the hotel isn't paying, as it was on this evening. Having said that, an evening sat on the cosy sofa in front of the fire is something special, and the service and stories of head barman Antonio help to make it seem much less sterile and institutional than many London hotels. 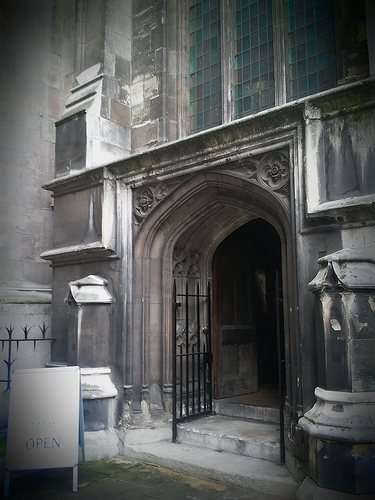 In the heart of the City of London, on a site that has been home to a church for more than 900 years, St Mary Aldermary was only partially destroyed by the Great Fire of 1666, and some elements of the foundations, walls, and tower still date from an earlier age. 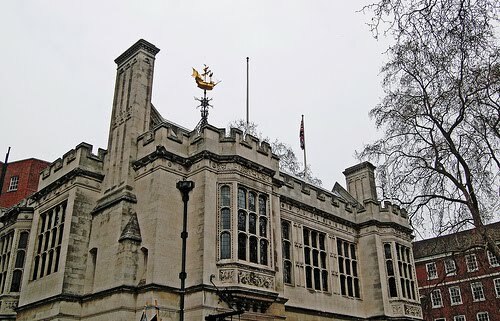 Sir Christopher Wren's rebuild in 1679-82 - under the supervision of his deputy John Oliver - followed the style of the earlier church, originally funded through a legacy from grocer and Lord Mayor, Sir Henry Keeble, after his death in 1518. 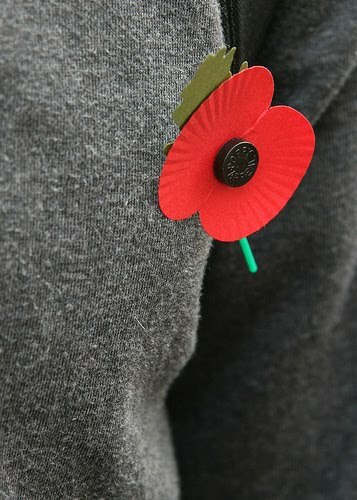 On Remembrance Sunday, The Queen, her Cabinet, and representatives of the Armed Forces, Merchant Air and Navy and Fishing Fleets, and others gather at the Cenotaph to remember the fallen, but always a much more poignant spectacle is the hundreds of veterans of military conflicts around the world who take part in the British Legion's official march past, following the ceremony. Veterans of many ages help to convey the message that it is real people who fight and die, and not the politicians or heads of state, and the hundreds line the route and watch them.